Today's Draw: Knight of Bows from a trimmed Wildwood Tarot in the What to Avoid position from the Deck of 1000 Spreads. Do you spend too much time one on aspect of your life to the detriment of other parts of your being? If you died tomorrow, would there be any regrets about it? What undiscovered gem of life might be standing right in front of you, waiting for you to shift your focus? Today's draw is one of the reasons I don't like to reversals. For the uninitiated, reversals are cards that, when you turn them over, end up upside down. And many people read those as roughly the opposite of a card's meaning. But I don't read reversals, primarily because I believe the position the card lands in can create the same outcome. 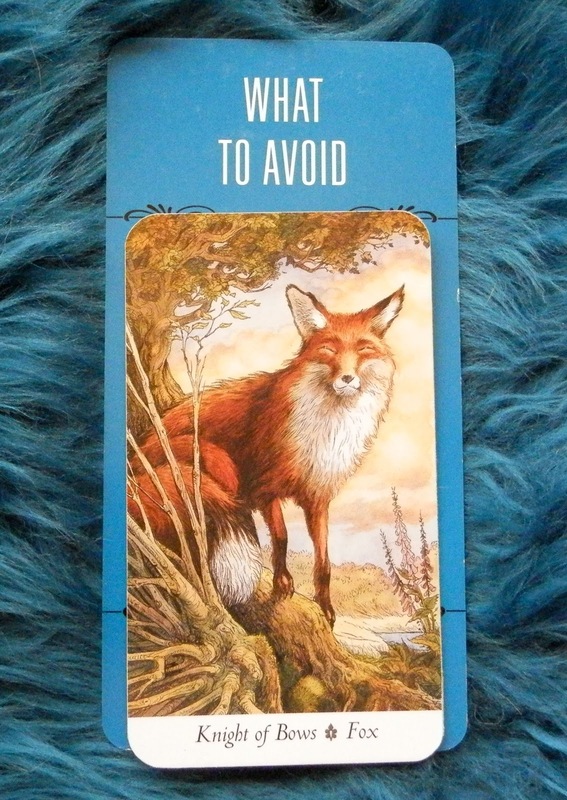 So, for example, today's card of the Fox is about stealth and cunning, playfulness and determination. None of those are things we would want to avoid. So reading the card in context of its spread position, you'd look at the shadow side of that card, like being opportunistic, manipulative, childish and ruthless. Shadow sides come from too much of a good thing. Leadership is a good thing. But when you go all leadership on people's arses, it's called megalomania. Not a good thing. Another way of looking at it is how the book for this deck spelled out the downside of this card—"Determination leads to success, but often at a great personal cost." I'll cop to being one of those women who focus too much on career...to the detriment of my personal life. I even ended up turning one of my personal life hobbies into a second career so I could work even harder...haha. Mind you, I'm not complaining and I won't use the word "regret". I enjoy the things I do. And because I'm at home when I do all of them, my dogs never feel lonely or neglected, as far as getting their needs for attention and sustenance met. But there are so many things that fall by the wayside because I'm now attending to two different careers. I don't get out as often. I don't exercise often. I don't spend enough time with friends. And most of my friends are the same way, so they don't have time to spend with me. So while I don't regret it...my life is full...I could nonetheless find a healthier balance. I see a lot of this around me. Women who devote all of their time to their children and husband and spend no time developing their own personal relationship with self. People who dive so deeply into their relationships that they have no friends. Certainly we shouldn't neglect the things we need to attend to in our lives. But having friendships, personal interests and a personal life are also among those things we shouldn't neglect. Anytime we pour so much of ourselves into one thing or another, we put ourselves at risk. If we lose that one thing that identifies us, then who are we? But beyond that, we're cheating ourselves out of part of life we came here to experience. Having just one or two aspects of ourselves supporting the entirety of a life is a precarious foundation to build on. It's simple principle of engineering. That said, I enjoy my life. Especially now, because a lot of things are coming to a successful conclusion. But I think we all have to ask ourselves, if we died tomorrow or a year from now, is there something we'd wish we'd had more of in our lives? I wouldn't have any MAJOR regrets, but I can see where I'd be a little wistful about things I could have done more often or had more of in my life. Even just tonight, I was sitting on my front stoop watching the sunset and seeing the neighborhood happen. I'd only done that once before and that was just last week. All these years and I never experienced life from a perch on the front stoop! It made me sad that something so in-my-face had been overlooked for so many years. What might you not be seeing for all your determination in life?